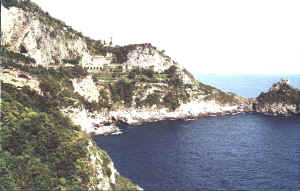 The "grotta dello Smeraldo" is five Km far from Amalfi, following the "Strada Statale 163" to Positano. It is placed in one of the best bay of the Coast, in the Municipality of Conca dei Marini. 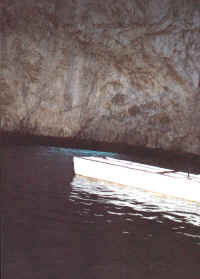 You can reach to the "Grotta dello Smeraldo" also by boat; infact from the Amalfi's harbour many boats go to and for the cave, each hour. the geology of the cave: stalactite and stalagmite. The cave is called "emerald", because the sun light comes in, throught a tunnel under the water (the tunnel connects the cave to the open sea), it makes the emerald colour. We can still see, under the water, at 4 meters deep, a special Christmas Crib in ceramics, gave to the local fishers. The cave was discovered, more than 60 years ago, by a fisher, who took a look throught an hole on the rock.